2" x 3/4" Schedule 80 Gray PVC Threaded Reducing Bushing | U.S. Plastic Corp. These are Schedule 80 PVC threaded fittings. Schedule 80 is also NSF listed, has a 33° F - 140° F working temperature, and is available in gray. For UV resistance of PVC pipe and fittings, paint with a white water based latex paint. 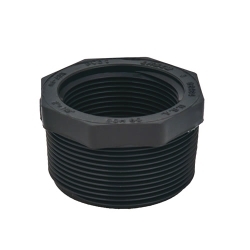 All Schedule 80 threaded fittings are manufactured in strict compliance to ASTM D 2464. 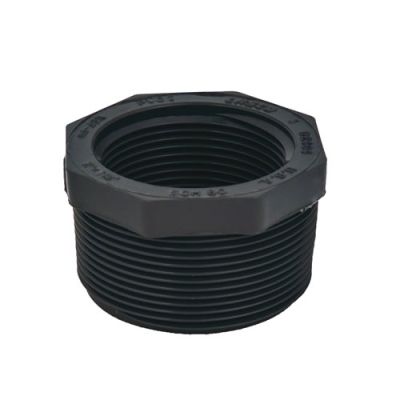 PVC Schedule 80 fittings are produced from PVC Type I, cell classification 12454, conforming to ASTM Standard D 1784.